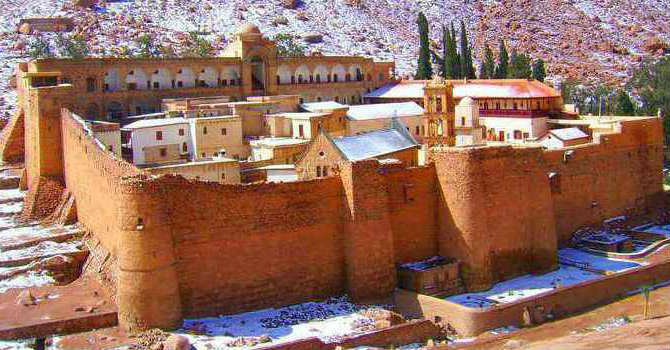 Our guide will pick you up early in the morning from your hotel in Sharm to explore the Monastery of St Catherine, it is the top religious and cultural site in Sinai. Travel for approx. 3 hours with modern private air conditioned van with your proficient tour guide who will provide an in depth insight into the history & religious designation of the monastery and the area around. It is located at the base of the mountain where Moses received the 10 Commandments, one of the most famous monasteries in world established between 527 and 565 AD and believed to be put up around the biblical Burning Bush. The Monastery was named after St Catherine who was decapitated for her Christian faith, you will explore the Orthodox Church, the worship icons and the famous Mosaic of Transfiguration. Get your Lunch in local restaurant near the monastery then transfer to Dahab for short visit then transfer back to hotel.